My mother Ruth Elizabeth [Gray] Pearce, my brother Carl, Uncle Merle, all of whom have since passed, and Aunt Betty, and I met King’s Restaurant in Gibsonia along Rt. 8 north of Pittsburgh for Lunch on May 8, 2003. Afterwards, we drove east on Rt. 910 to Campbell Road [see notes on that aspect of the tour pertaining to Ruth’s maternal grandparents, the Campbells]. 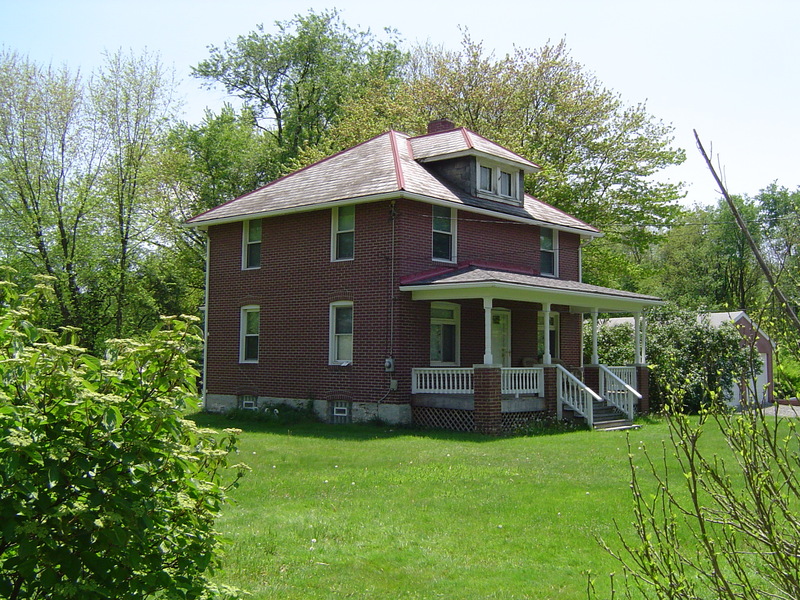 After visiting that homestead and the East Union Church and Cemetery, we turned our attention to three Gray family Allegheny County locations: First, the original William Gray (1816-1879) home and farm; second, the home my Grandfather Paul Barton Gray (1892-1977) built around 1917; and third, the Bull Creek Cemetery, where most of my Gray ancestors are buried. This collection of remembrances allows me to recall, preserve, and reflect on the events and thoughts of that wonderful day. I hope you will continue to read and enjoy the tour as well. The small community of Bairdford [sometimes called Bairdsford with an “s”], just off the Orange Belt [Pittsburgh’s ancient and rugged answer to modern beltways around other major American cities] between Saxonburg Boulevard and Rt. 910, sits atop a wooded hill and, until recently, has always served two masters: farming and coal mining. Except for the various types of aluminum and vinyl siding and a coat of fresh paint here and there, the houses look like they always have anywhere else in Appalachia, going back at least a century. Today, there’s a new Catholic Church, U.S Post Office, and park containing an enormous dusty pavilion where most of our family reunions have been held for the last 25 years. But, the tennis courts and softball and soccer fields in the park almost seem out of place in a town struggling with high unemployment where space otherwise seems to be at a premium. 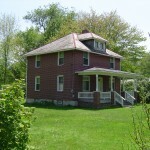 Just northwest of the main street and behind an early to mid-twentieth century, fallen down brick elementary school, at 56 Kaufman Road, sits the 150 acre former Gray homestead. Like other parts of Bairdford and West Deer Township, the site mixes the old and eyesore with the new and magnificent. The two-story corner school, successor to a one-room wooden structure that was located over the stream near the park, was abandoned after the asbestos cleanup laws were passed in the 70’s, the district claiming it was too poor to make it safe again. 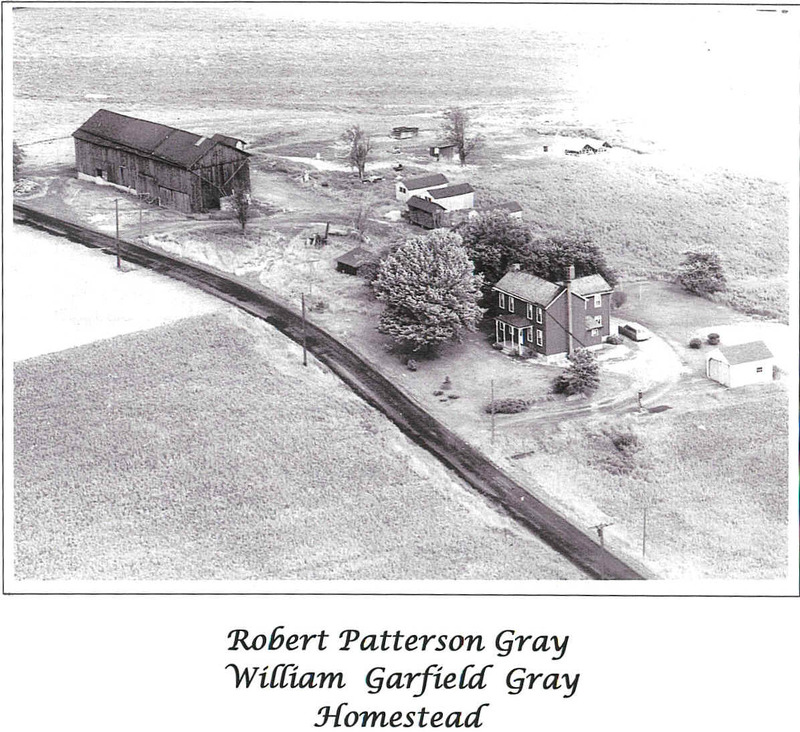 But, at least half of the Gray farm was sold off about the same time in 10 to 12 large lots, which now contains some very large and attractive homes. The great irony was that, when they were constructed, there was no ground water to be had due to the network of subsurface mining that had been done over the preceding years. Yet the new residents went ahead with their rather expensive investments in full faith that the township would eventually provide public water lines. But, for years, they relied on the water buffaloes that came to Kaufman Road weekly. Across the macadam is a sign announcing “The K – Farm.” We haven’t met the Kaufmans, but we assume they’re good folks. They’ve kept the old Gray house in good order, the elegant wooden structure that’s provided warmth and security for four generations [see “My Gray Family Genealogical Line”]. The large barn faced the house from a distance of about 50 yards, but it has been torn down to make room for a metal shop. I’m told that the latest owners work on antique car restoration in there. The barn over the years had stored potatoes, apples, corn, hay, and feed for work horses, cows, and chickens. The Grays ate well and never went hungry according to the clan elders. In fact, there was always enough to share with other members of the extended family, especially after my Grandfather Paul began his quest to raise 12 children. We’ll get to him in a minute, but first I’d like to relate some information about the old homestead sent to me in June, 2005, by Ella Mae Grubbs, Uncle Will’s daughter who married Wilson Grubbs. 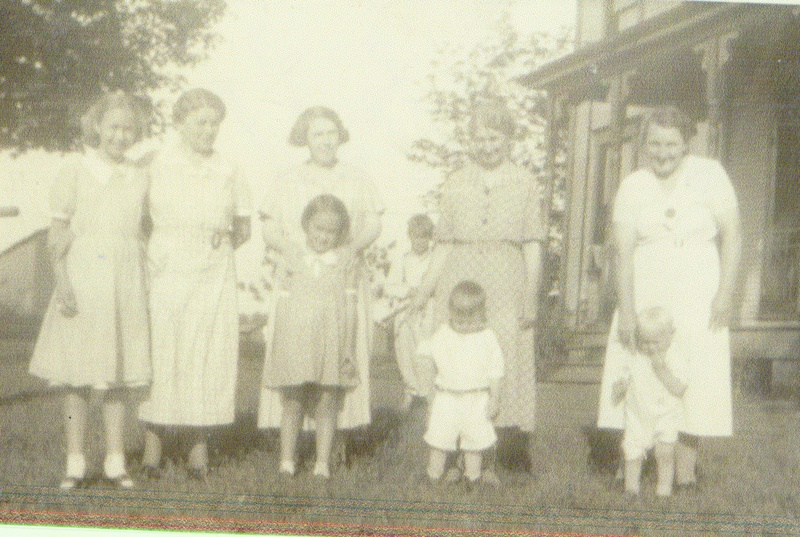 As early as 1936 the Grays decided to gather at the farm for a family reunion. Pictures were taken then and we hope to include more of them sometime in the future. 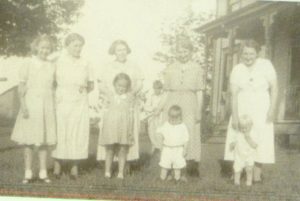 They included the four women of the clan and some of their children: the two Berthas (nee Campbell who married Paul and was with youngest son Lawrence; and nee Bonin who married Will and was with son David), Elma (nee Rush who married Russell Stanley and was with Dorothy), and Janet (nee Gray who married Howard Kellar and was with Janet Louise). The highlight of that reunion was the five gallons of ice cream packed in dry ice. I can remember how excited most everyone was. It meant Uncle [Russell] Stanley, Uncle Paul, and Aunt Janet were back home on the farm they grew up on. My father William [Uncle Will] Gray stayed on the farm. I can remember getting ready for the reunion, for Daddy to get all the farm work done in the summer and have time to have the area around the barn all mowed and cleaned. There was a long distance between the barn and house to mow – no riding lawn mower – a few flowers trimmed and all the chickens [put back] in the chicken house. I can remember how hard we worked and finally the day came. It was a nice sunny day—God blessed us good. Everyone had fun. But, Mother was getting older and to have another reunion was too much. No one else offered to have the Reunion. Ella Mae continues about how she and her cousin Addie [Kellar] Hagan kept after everyone to hold another family picnic, and thus the first annual Gray Reunion was held on a Sunday in 1955 at North Park. [See “Fifty Years of Gray Reunions.”] She remarks how then the question of whether or not to allow beer came up. She recalls that her father, our Uncle Will, believed that if the gathering were to be called the “Gray Reunion,” it should reflect they way they were all “brought up:” no beer, no cards, Sunday as a day of rest after hard work, and peace within the family. One of his favorite sayings was, “Anything to keep peace in the family.” He said it in his “everyday” kind voice, but you knew he meant it. Ella Mae explains, “That is the way he always talked to my Mother [Bertha Bonin Gray]. 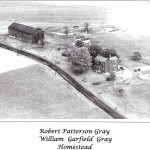 I don’t remember Daddy ever speaking harshly to my mother, nor Mother to Daddy.” That certainly provides an insight into the lives of the William Gray family back on the Bairdford homestead. But, our tour with members of the Paul Gray family continued that day in May. Paul Gray married Bertha Campbell during the First World War. Apparently, that conflict was small enough that the draft never reached the Gray farm in Bairdford, although Bertha’s family was well represented [see “Raymond Norman Campbell’s WW I Diary,” in three parts]. According to their daughter Ruth, my mother, Paul was both a farmer and a carpenter all his life [see “Memories of My Mother,” in four parts]. None of the Grays that I know of ever worked in the local coal mines, but my Uncle Merle believes that Paul and his brother Will each put up some investment money to provide housing for the coal miners in Bairdford just after the war. The monthly rent for the small wooden structures was $15, but that was a lot of money in those days, and apparently the bank foreclosed after a prolonged period when the mine work was slow and the Gray brothers couldn’t make the loan repayment. This would have been the first of two times in Paul’s life that he lost real estate due to economic hardships. The second time was in the mid-thirties when the Great Depression collided with his need to feed nearly a dozen children and he lost his Cooperstown farm temporarily to a sheriff’s sale. The first house that Paul built is still standing where Monier meets the Culmerville Road, a brick monument to a young man with lots of ambition and big plans for the future. Uncle Merle told me that he and his late brother Norman “Bob,” when they were still living there, used to ride their bikes the 9 ½ miles to their grandfather’s farm in Bairdford. Fortunately, the ride home was mostly downhill. He said that they could wear out several sets of tires in a single summer. Today, the two-story house in the trees is home to the elderly Mr. and Mrs. Paul Farnen. Unfortunately, according to Mr. Farnen, the Ford Colleries have been slowly subsiding over the last 85 years, causing the old house to settle on one side as much as 2 ¼ inches from the roof to the ground. But, it’s still a beautiful structure and one that has long outlived its builder. Leaving the Bairdford area to get to the Bull Creek Presbyterian Church and Cemetery, we crossed the crooked Saxonburg Boulevard, which begins at the Allegheny River mill town of Etna and runs through the now prosperous Pittsburgh suburb of Fox Chapel, originally settled by our above mentioned Campbell family in the early 19th Century, and on to the scenic Butler County community of Saxonburg. I say “scenic” because several Hollywood studios have used its lush level farmlands as backdrops for scenes supposedly depicting the American Midwest. But, until about 1925, according to Merle, Uncle Will and Grandpap Paul’s brother Russell Stanley had owned a Ford dealership along this busy thoroughfare, about the time the last Model “T” was sold in America. That small garage is still standing today, but in those days the rural car dealerships were rather modest, and when Henry Ford began setting his sights on bigger and better things, the factory no doubt, as today, put pressure on the local representatives to sell more vehicles. Fortunately, his son-in-law Merle Perry was able to move the franchise to a larger and more profitable location along Rt. 19 in Zelienople, where he ran it for many years. 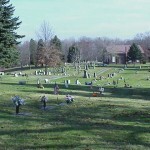 Our tour of the Gray homesteads in and near Bairdford, Allegheny County, ended where the lives of at least four generations of Grays before had: with a visit to the Bull Creek Presbyterian Church Cemetery. Our family association with the church began before 1802. At this time we don’t know if first generation Americans James and Mary Patterson Gray are there, but we visited the graves of their linear descendants William and Elizabeth Leslie Gray, Robert Patterson and Annie Sims Norris Gray, Paul Barton and Bertha Ione Campbell Gray, and some of my mother Ruth’s siblings and their families. 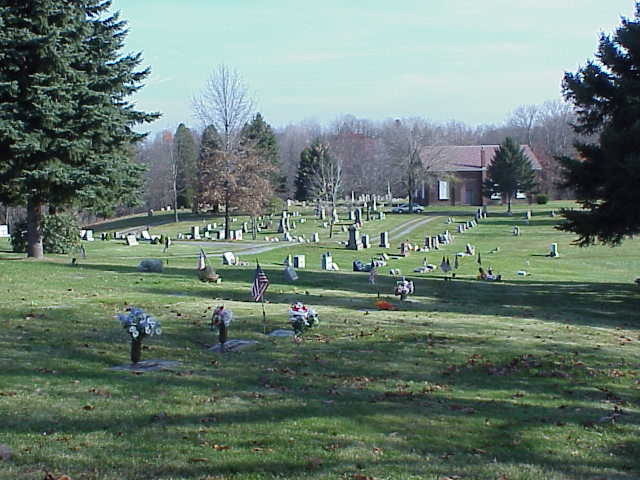 My grandparents rest in the newer northern section, but those who died in the early 20th Century and the 100 years or so before are south and east of the old brick church dated 1833. Our earliest Grays are less than twenty feet from the corner of the structure and the road. The Leslies, the Norrises, and the Browns, all in-laws, are just slightly further away, down the slope of the hill. In conclusion, it’s easy to see by this typical old American churchyard how the lives of our pioneer ancestors intertwined. As I’m just into my second half-century of life and only beginning to appreciate the rich heritage these good folks have left me, it’s as if they lay there waiting to be discovered and newly appreciated for the hardships they endured and the sacrifices they made in their lifetimes for family. I’m glad I was able to tour with my living family that day, but my appreciation of our ancestors is only beginning. My calling, I believe, is simply to write about them and share their lives and experiences with the next generation. Often it means engaging the younger folks in discussions about our past, although even I was once reluctant to listen when my elders tried to tell me things about “dead poets,” ala Robin Williams. It means making a phone call and offering to get in a car to visit the homesteads and the cemeteries. But today, thanks to computers and the Internet, telling the next generation about the last can be as simple as posting a story at a website, as I am doing here. I hope you’ll join me in preserving the memories and the values of families like the Grays for many years to come.